Hyakkaou Private Academy. An institution for the privileged with a very peculiar curriculum. You see, when you’re the sons and daughters of the wealthiest of the wealthy, it’s not athletic prowess or book smarts that keep you ahead. It’s reading your opponent, the art of the deal. What better way to hone those skills than with a rigorous curriculum of gambling? At Hyakkaou Private Academy, the winners live like kings, and the losers are put through the wringer. 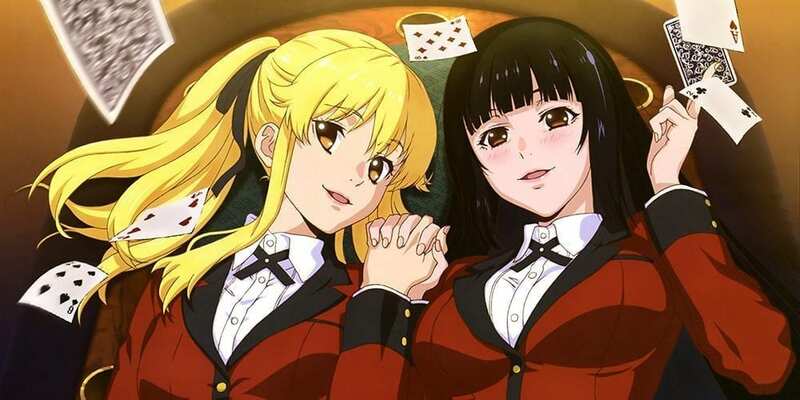 Jabami Yumeko, a compulsive gambler who’s addicted to challenges and games, continues to seek out increasingly challenging competitors, dangerous games, and higher stakes at the school. How are the subs? Are these the best one available? Currently, yeah. But if by any chance Hiryuu or any other more well known fansub sub this show, I will replace them. Aurora please don’t do 20crf. The reason I come to this site is to get small sized anime. If I had wanted bulky oversized episodes I’d download the fansub itself. The fansub video is around 500mb-800mb for 720p so my encode is 1/3 of that size. However, I can totally understand that people just want smaller encode so all of the encodes will be updated to 25 crf today. Check it out later.